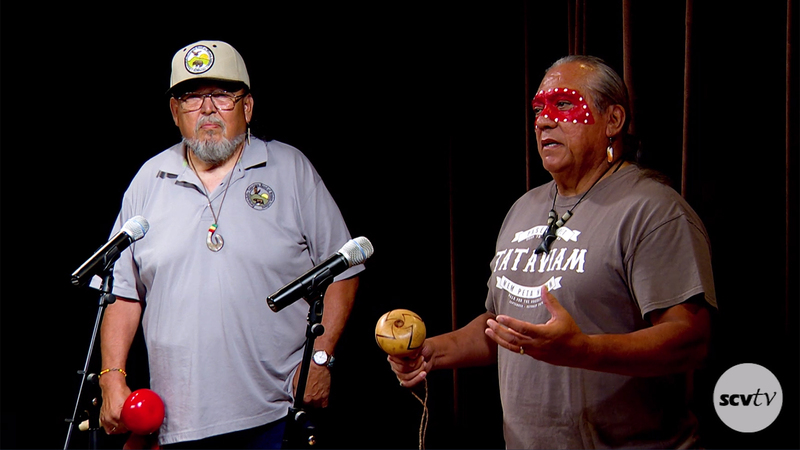 Ted Garcia Jr. and his younger brother Dennis Garcia (Tataviam/Chumash/Serrano) teach about traditional lifeways through song and storytelling. Enrolled with the Ferandeno-Tataviam Band of Mission Indians, Ted and Dennis Garcia trace their ancestry to individuals who lived at Chaguayabit village (today’s Castaic Junction) and elsewhere in the greater Santa Clarita Valley, southern Antelope Valley and San Fernando Valley at the time of European contact in 1769 and for a thousand years before that. Ted Garcia, a spiritual advisor to the annual Hart of the West Powwow at William S. Hart Park in Newhall, is also an accomplished stone carver. Having studied artifacts to understand the subject and style of his forebears’ ceremonial and decorative objects, he executes finely crafted sculptures from locally sourced stone. One of his carved canoes can be seen in the permanent “Becoming Los Angeles” exhibit at the L.A. County Natural History Museum. Collectors can find him at the annual American Indian Arts Marketplace at The Autry. Dennis Garcia is a traditional native dancer who gives presentations at L.A.-area schools, The Autry, Satwiwa Native American Indian Cultural Center in Newbury Park and elsewhere. The presentations often include a display of his regalia, rattles, dance and clapper sticks and soapstone carvings made by his brother Ted. Dennis wears distinctive red face paint when he dances, explaining that the mask was traditionally for protection. He keeps busy in his retirement as an extra in the movies. The Garcia name comes from Ted and Dennis’ gr-gr-gr-grandfather Santiago Garcia, who was born about 1833 to Native American and Californio (Spanish) parents and settled in the Little Rock Creek area. Santiago Canyon (where Acton is located) is named for him. Yea! Love their songs and stories! Very informative. Thanks for sharing some of the real history of the SCV.